Breast augmentation is a plastic surgery procedure designed to enhance the size, fullness, and volume of breasts in proportion to the rest of the body. Plastic surgeon, Dr. Brian J. Parker, provides this surgery to his patients in Las Vegas and other areas. He will educate the patient about all aspects of the cosmetic surgery during the initial consultation in order to help them make an informed decision. Here is a list of FAQ on breast augmentation that should provide some basic insights about the procedure. Who is a terrific candidate for breast implant surgery? Breast augmentation procedure may be recommended by a cosmetic surgeon to suitable candidates who are fit for surgery and will benefit from an implant procedure. Women with natural small breasts or even others who are unhappy with the size of their breasts and want to increase the size for aesthetic reasons may be outstanding candidates. If a woman has experienced loss of breast volume following a pregnancy, she may choose breast augmentation. In some cases, breast augmentation plastic surgery may also be performed as a reconstruction procedure following a mastectomy. Dr. Parker performs this surgery in Las Vegas only once he is satisfied that the patient is suited for this procedure in every way. How to determine the appropriate size and type of implants? The final outcome in a breast augmentation cosmetic surgery procedure depends to an extent on the right choice of implants. Patients have a choice between saline and silicone gel implants, and the plastic surgeon will explain the pros and cons of both options to help the patient make the best choice. Implant sizes vary from 180 cc to 960 cc, and the ideal choice for size would be the one that goes with the body’s proportions. However, this can be a personal decision, and some patients may want to exceed the proportions to have more enhanced breast appearance. Is breast augmentation a safe procedure? Both saline as well as silicone breast implants have been approved by the FDA after extensive studies and trials. Tens of thousands of women have successfully undergone breast augmentation surgery. The procedure is highly safe and predictable, as long as it is performed by an experienced and qualified breast surgeon. 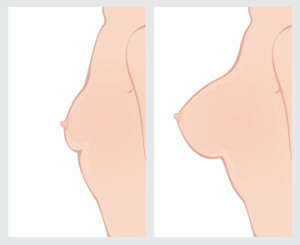 Typical risks that are associated with any surgery are also a part of breast augmentation, but advanced surgical techniques and high quality implants have made the procedure much safer. Today it ranks among the most popular plastic surgery procedures in the United States. If the breast augmentation surgery is performed by a skilled and experienced surgeon, chances are that the patient will go through minimal bruising and swelling. Pain relieving medications may be required only for two days in such a case, and the patient may resume regular activities in three to five days. However, the recovery period may vary for different patients depending on the extent of surgery performed and the healing ability of the patient. Is there an expiration date for implants? There is no expiration date on breast implants. Patients can continue with the implants as long as they are happy with them, and the implants have not developed any problem such as capsular contracture.